We're pleased to offer the highest quality precision CNC kit for the Scamp design. Kit includes all plywood components (planks, bottom, bulkheads, seats, cabin, decks, etc.). Many pieces include notches or scribe lines and numbering to aid construction process. The basic kit also includes a pre-cut building jig. Kits use precision jigsaw puzzle joints instead of labor-intensive scarfs, and the planks' variable bevels are pre-beveled so that they match-up perfectly right out of the kit. 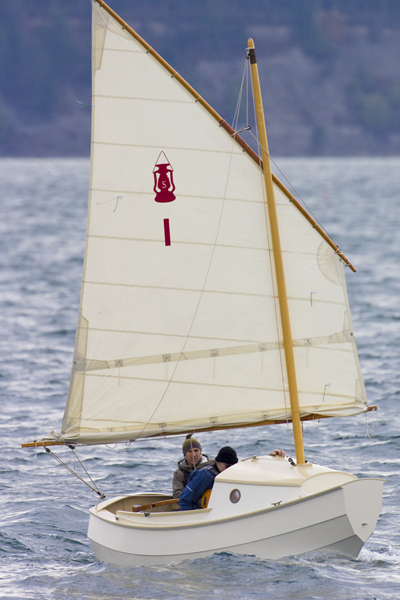 We also offer additional Scamp component kits, including: a foils kit (rudder and centerboard as 18mm okoume halves), a beautiful class sail made by world-class sailmaker Neil Pryde, and watertight custom hatch kits from Russell Brown and Port Townsend Watercraft.